The largest and most distinctive insect in Britain's fauna, there being about 1200 named species of Stag Beetle world-wide, it grows to 8cm (3.25in), but usually 5cm (2in) long. Once common over much of Southern England and Wales, they have been in decline over the last 50 years and are now scarce becoming rare and listed as a globally threatened / declining species that is protected species under Schedule five of the UK's Wildlife and Countryside Act 1981 and the EU Habitats Directive of the Bern Convention. Adults appear during late May to the beginning of August being most active in the evenings. Females ♀ lay their eggs in a piece of decaying wood with the larvae taking between 4-6 years to reach the pupal stage going through several instars in the process. At this point it buries itself in the soil for about three months, then during the warm summer months it emerges to fly off (somewhat badly due to their size), find a mate and die. 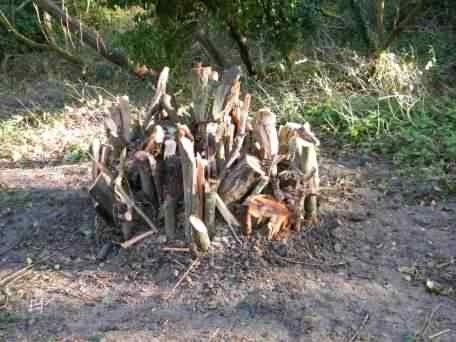 Stag Beetle larvae, which are blind and shaped like a letter "C", feed on rotting wood in a variety of places, tree stumps, old trees and shrubs, rotting fence posts, compost heaps and leaf mould. The larvae have a cream coloured soft transparent body with six orange legs, and an orange head which is very distinct from the very sharp brown pincers. They have combs in their legs which they use for communication (stridulating) with other larvae. The name cervus is derived from the mandibles of the male ♂, which look like the horns of a cervus. The Stag beetle is predated on by Magpies, Badgers, Foxes, Hedgehogs, Cats & Woodpeckers. The natural reaction of the beetle to an approaching large object is to remain motionless making them a good photographic subject. 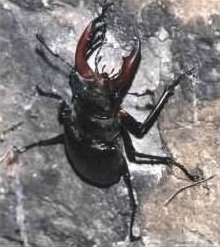 Sexually dimorphic in that the males (who have enlarged mandibles) are larger than the females. Capable of a slow awkward lumbering flight usually at dusk making a very low distinctive buzzing sound, the males seem to fly more readily than the females. Adults only live for a few months feeding on nectar and tree sap. The Stag Beetle is a listed species in the Biodiversity Action Plan for Hampshire, as a national stronghold species of local importance, with a declining population, locally scarce with an undetermined threat rating. 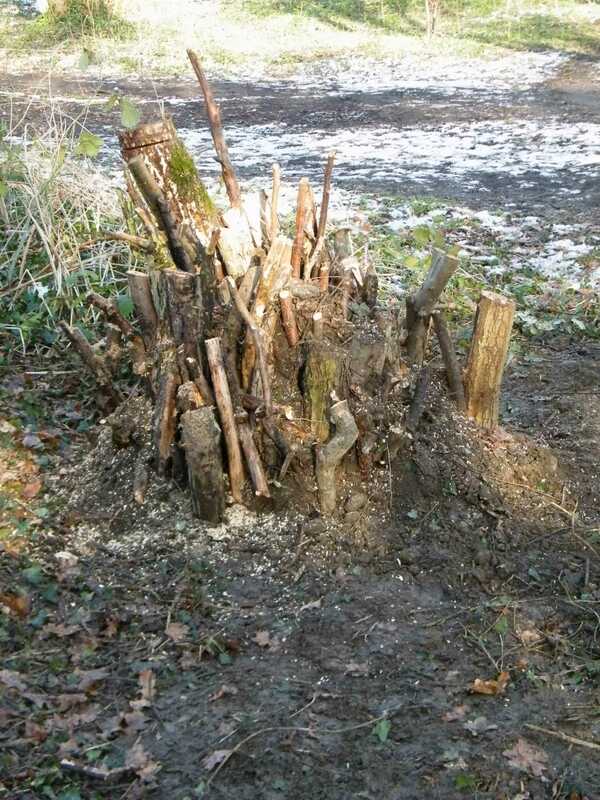 Listed in ancient semi-natural woodland, pasture woodland, parkland and urban areas. 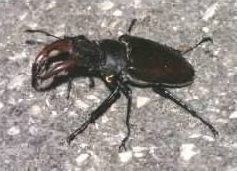 A SAP exists for the Stag Beetle as a high profile or indicator species. 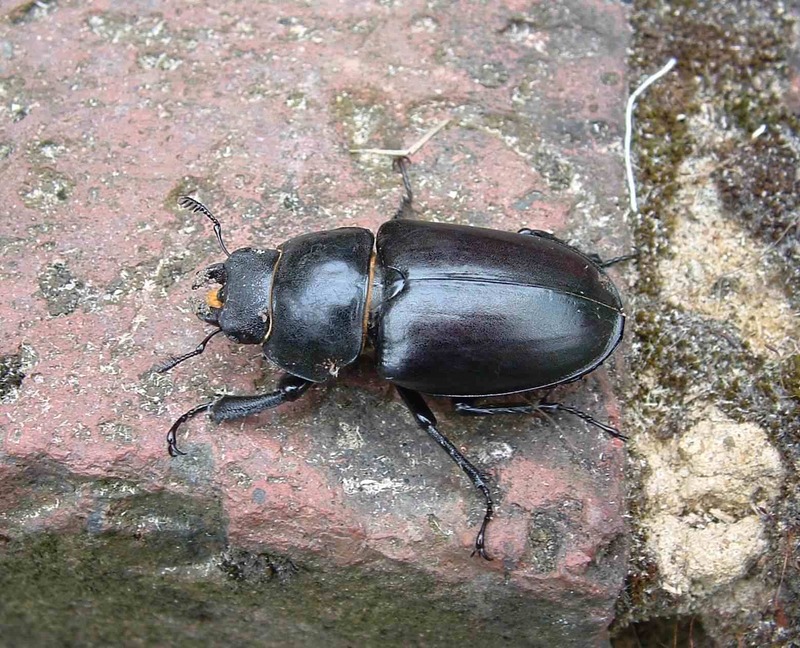 The Stag Beetle has a UKBAP priority species and HBAP species rating, is listed in the Habitats & Species Directive schedule 5, and is a Nationally Notable B species.